Many local and inte rnational observers have denounced Philippine President Rodrigo Duterteâs conduct towards China as âappeasementâ after he took the view there was nothing the Philippines could do to stop Chinaâs militarization in the South China Sea. Duterteâs defeatist attitude, allegedly the trade-off of comprehensive engagement with China, is being put to a critical test as domestic voices in the country press for stronger actions to contain the looming Chinese threat to Philippine external security and maritime claims. However, to pass judgment on Duterteâs foreign policy based solely on his underdog pronouncements towards China overlooks the broader gains of his foreign policy. In assessing Duterteâs foreign policy, it is necessary that it be juxtaposed with that of his predecessor, Benigno Aquino III. The Aquino government had its fair share of diplomatic and strategic gains. It put a moral value on Philippine maritime claims and earned the country a bargainin g chip by securing a legal victory at the Permanent Court of Arbitration, and accelerated the modernization of the Philippine armed forces. To pass judgment on Duterteâs foreign policy based solely on his underdog pronouncements toward China overlooks the broader gains of his foreign policy. But the arbitration, together with the Aquino governmentâs outright alignment with Washington and diplomatic confrontation with China at every regional forum, led to several unwanted outcomes for the Philippines. The risk of conflict increased as there was sustained harassment of Philippine supply vessels and fishermen, and it appeared that Sino-Philippine bilateral relations only revolved on the South China Sea. Moreover, China unabashedly carried on with its land reclamation operations. In contrast, Duterteâs foreign policy has adopted broad engagement with China, bilateral consultations on the South China Sea, and an assertion of strategic autonomy from US foreign policy. This has produced favourable, if targeted, results for the Philippines. First, the countryâs diplomatic and political relations with non-traditional partners have improved. For example, apart from the US and Japan, China and Russia have unprecedentedly provided military aid and assistance to the Philippines. Second, arguably because of the uncertainty that Duterte introduced to Philippineâ"American alliance, Manilaâs diplomatic and strategic value to Washington has increased, which can be observed in the latterâs improved offer of military assets. Third, major powers such as China and Japan are competing for infrastructure and development projects in the Philippines. Yet, Duterteâs other notable efforts include the long-overdue structural improvements on occupied features in the Spratlys and the continuation of Aquinoâs military modernization push, with additional plans to acquire another squadron of fourth-generation fighter jets from South Korea and diesel-electric submarines from Russia. Like Aquino, Duterteâs foreign policy is not without downsides. His adulation of China alongside repeated defeatist statements has created a perception that the Philippines is helpless and desperate for Chinese economic carrots. 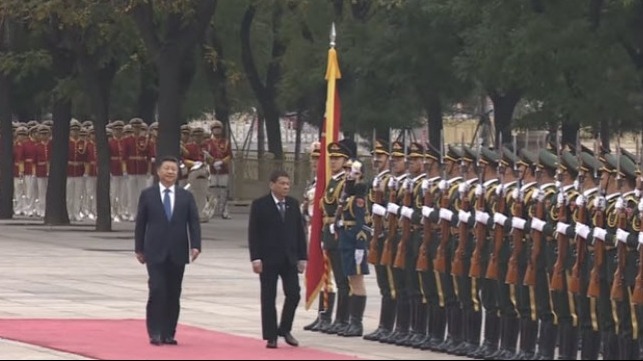 While Sino-Philippine relations have improved overall, Beijing has still militarized the South China Sea, just as it built artificial islands during the Aquino government. It is thus reasonable to ask whether Duterteâs strategy has changed Chinaâs behaviour. Under Duterte, interceptions of Philippine supply vessels and fishermen have ceased, but the militarization of the waterways has continued, which makes Duterte confident that Chinaâs efforts are directed at the US. After all, Duterteâs mindset is that the Philippines ought to be disentangled from great power politics. Given this, Chinaâs dilemma is in overcoming âsecurity interdependenceâ, or that situation where direct response to US actions would indirectly provoke insecurity from third-party states and lead to the potential erosion of political capital of their ruling authorities. To say the Duterte government has adopted a policy of appeasement may be prematur e, as the Philippines has not yet lost any of its occupied features in the South China Sea. Significantly, what the Duterte government has demonstrated is that there are alternative diplomatic strategies in safeguarding sovereign rights and national interests, which is partly reflective of other nationsâ (India, Malaysia, Vietnam) strategies on China. This refers to the abandonment of limited policy options (for example, a legalist position and alliance dependency) and engagement with China not based on want but on need (pragmatism) amidst lingering â" land and maritime â" border disputes. There are additional measures the Duterte government could take to have a more proactive foreign policy, and avoid an image of practising defeatist engagement or accommodation. It could stop giving voice to statements that imply an inferiority complex, for one. And it could also make clear the view that the realization of power, and not just international law, prescribes th e interaction of nation-states and the defence of core interests.